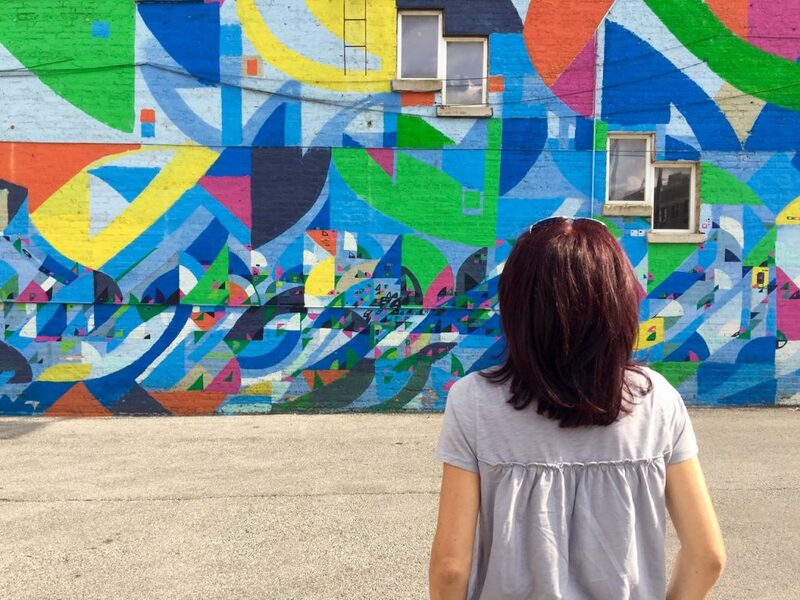 There are so many reasons to love Chicago and its incredible street art is one of them. 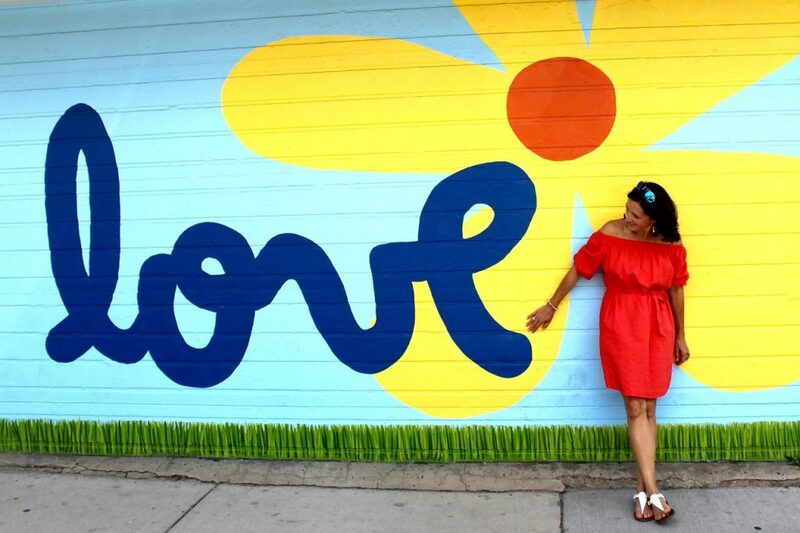 All kinds of wonderful murals and other colorful artwork are scattered all over the city’s neighborhoods… on buildings, walls, underpasses, bridges, stairways. This art form has dramatically increased in the Windy City over the past decade, along with its quality, diversity and creativity. If you want to see some of it, I have a few ideas for you. They include seriously artistically impressive works or simply fun artsy walls for a great Instagram shot (I went for an eclectic blend). For out-of-town visitors, tracking them down will take you to many cool Chicago neighborhoods, which are all worth exploring. For those living in Chicago, this list can be a guide to a fun field trip around the city. I have to start with “that famous Chicago sign”. To get this shot, you will need to venture to Logan Square, which a very cool historic Chicago neighborhood. You can take an Uber, of course, but if you are an out-of-town visitor, I suggest taking the El (the elevated train) for a total Chicago experience. Hop on the Blue Line and get off at the Logan Square stop. This mural is in a parking lot, just south of the train station. 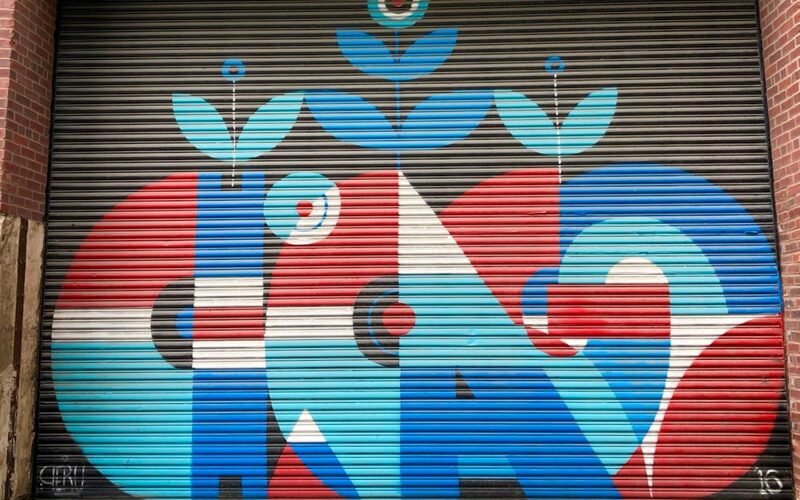 The artwork was created by Victor Ving, a former graffiti artist from New York City who has been traveling the country and creating similar works in other states. Apparently it only took him four days to paint this mural. 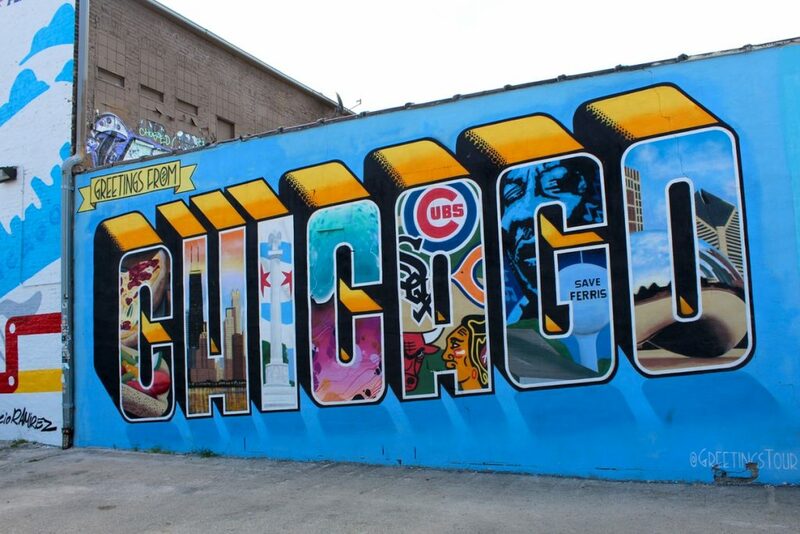 Can you figure out which Chicago icons are portrayed in each of the letters? Bonus points if you get the meaning of the second “C”! One flamingo, two flamingos, three flamingos, four… How fun is this wall with its pink birds and tropical plants? 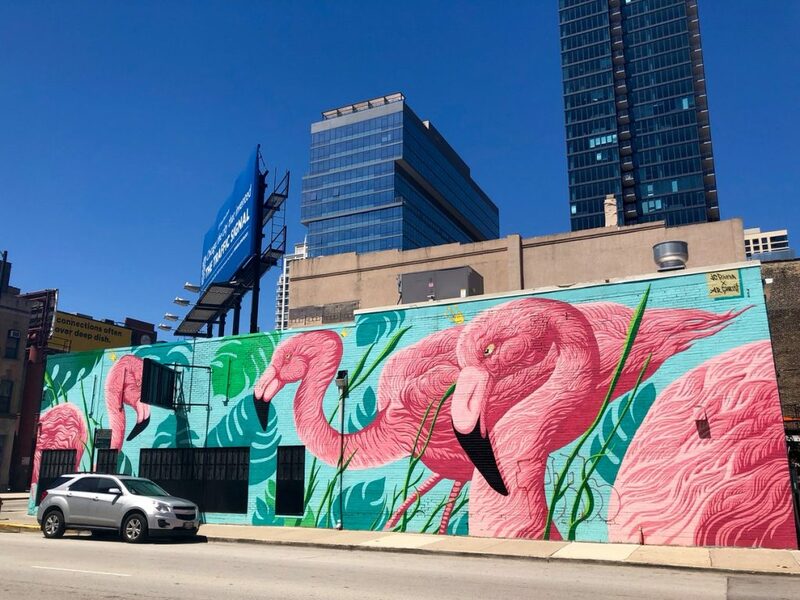 Located in River North, it is easy to get to for out-of-town visitors who don’t have time to venture to other Chicago neighborhoods beyond the downtown area. To get a picture of the full wall, you will have to time your shots with the traffic light nearby and hope for not many parked cars. Inside those fun walls is the Flamingo Rum Club, a Caribbean Inspired Rum Club & Cabaret in case you want to… you know, flamingle after you “gram” your shots. I first saw “wings on a wall” a few years ago in a photo somebody posted on Facebook from Nashville. I vowed to go there just to take that cool picture. These days, pairs of wings, feathery, giant, colorful, black and white or other types, can be found everywhere. There might be more than one pair in Chicago waiting for you to put on, but I just discovered this one in the Fulton Market area. It is very close to the Restaurant Row on Randolph which includes many Chicago’s most famous eateries such as Girl and the Goat, Belly Q, Bar Siena and my personal favorite, Leña Brava, by legendary Chef Rick Bayless. Another one easy to reach from the city center. Thanks to the signature, I learned that the author is Chicago’s Jas Petersen, “a young, intelligent and rebellious hybrid force in the contemporary art world”, according to her website. Jas seems to be celebrating women of all shapes, colors, dreams, moods and attitudes… the wonderful complex creatures that we are. I found another one of her girls that same afternoon at LACUNA (see #12), but there are many others scattered around Chicago. 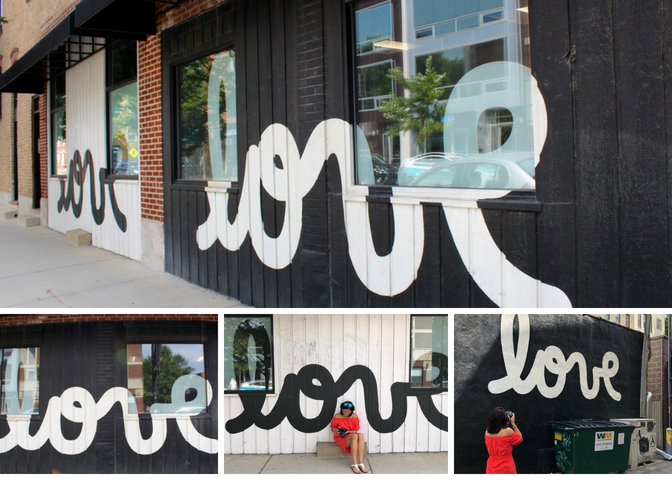 I was actually in search of another love themed wall in Bucktown, which I never found (I’m guessing it must have been covered over by the time I made it to the neighborhood), but my trip was not in vane: I found not one, but four cool LOVE signs on Damen Avenue. That’s a whole lot of love, in black and white or color, your pick. Why did the chicken cross the road? To make it into this article, of course. 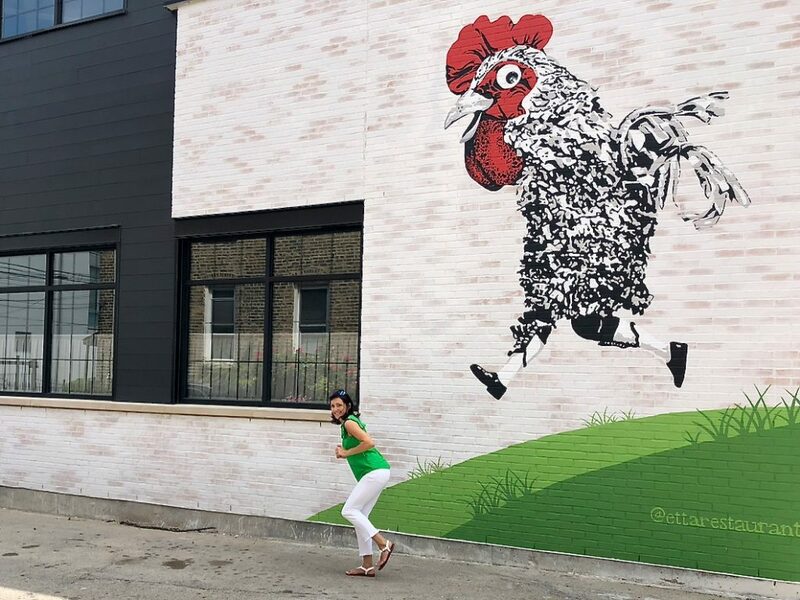 A chicken on human legs running along North Avenue might not get the highest artistic scores in the street art category (I think it is supposed to call attention to a restaurant around the corner), but it certainly makes the list of awesome instagrammable walls in Chicago. Don’t forget to do the chicken dance when your take your picture (it will turn out even better, trust me)! 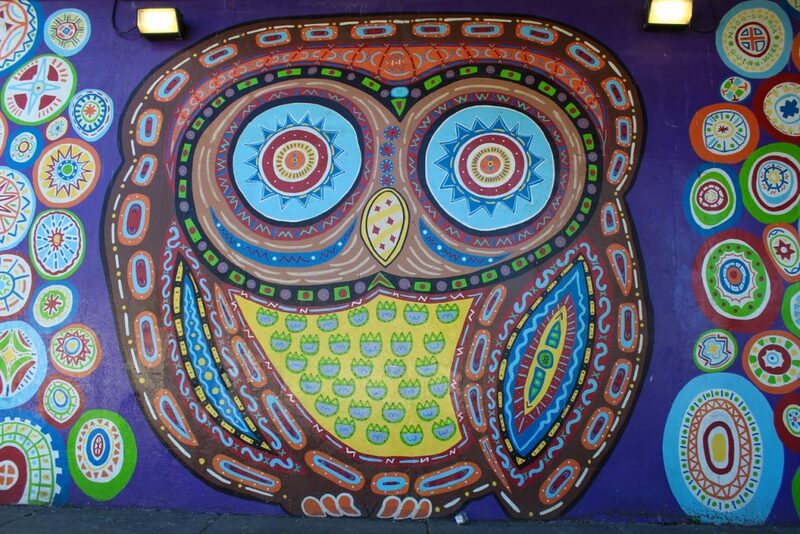 Known simply as the Owl, this mural has been whooting on Belmont Avenue below the Kennedy Expressway since 2014. 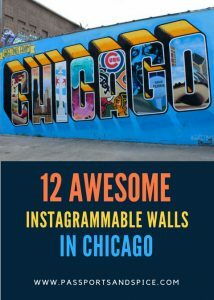 The author is Tony Passero, a modern Chicago artist and creator of several other beautiful murals in the city (see #9). You may start to recognize his artworks because of his style, which often explores themes through repetition and patterns. Just how cute is this owl? If you enjoy abstract art, you will like this one. I’ve seen this wall included in several Chicago fashion blogs, as a background to some sassy young model in color coordinated clothes. I’m listing it here so you can pick your outfit ahead of time. Just kidding! I’m listing it here because it is in Andersonville, a very cool Chicago neighborhood, worth venturing to. It is known for its diversity, Swedish roots, small-town charm and quirky personality. You will also find many of the city’s newest and hippest stores and restaurants, almost all independent, locally-owned businesses. Remember those patterns and repetition I told you about in #7? Here is another mural by Tony Passero. 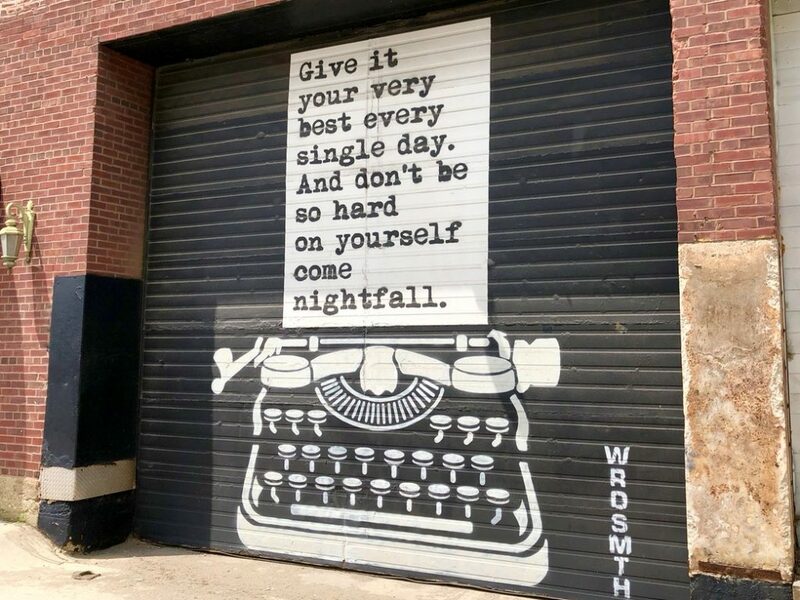 I’m including it not only because it is very cute, but also because it is located just below the 606 Trail, a 2.7 mile biking and walking trail built on an abandoned CTA rail line, another cool thing to experience in the Windy City. Nothing Like the Holidays, one of my favorite movies shot in Chicago, shows this wall in its opening credits. The movie takes place in Humboldt Park, the west side Chicago neighborhood, which proudly displays its Latino heritage through architecture, stores, restaurants and many murals. 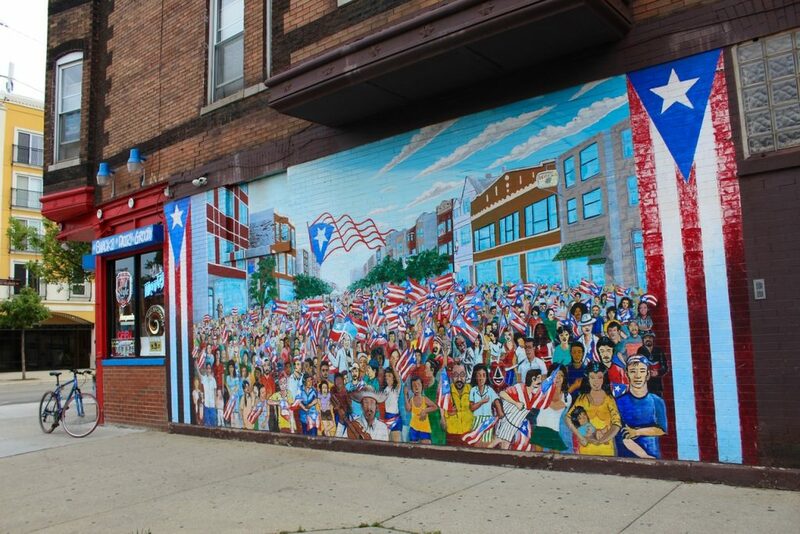 About one quarter of Humbolt Park residents are of Puerto Rican descent and this mural is a proud celebration of their roots. It depicts Fiesta Boricua, an important cultural and music event, which takes place in the neighborhood every September. It is also an intentional statement by the recently deceased artist, Gamaliel Ramirez, who included figures from the Puerto Rican independence movement holding Puerto Rican flags, alluding to the period when it was a felony to display the Puerto Rican flag in public on the island. 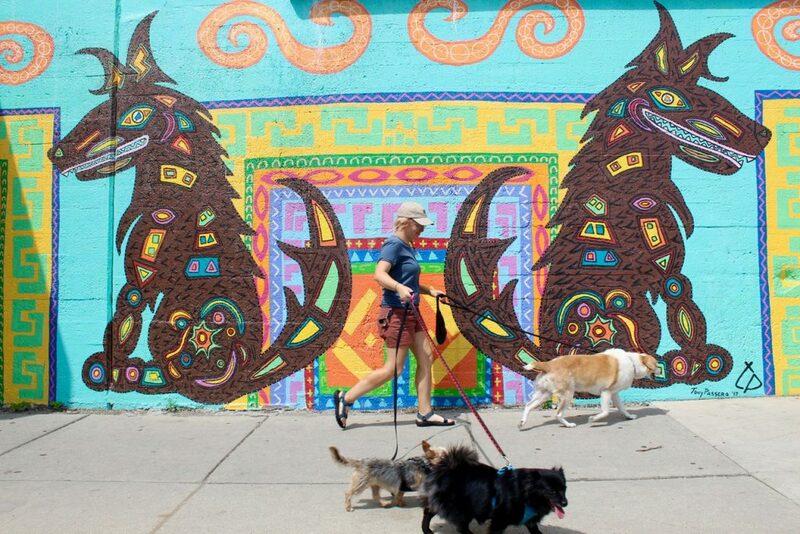 BONUS: I discovered this handy Humboldt Park Mural guide, if you would like to learn more about the area and see more of its fabulous murals. Pilsen, the lively Mexican neighborhood of Chicago, is known for its incredible murals which blend art, heritage and activism. There is so much street art in the area, my camera was working overtime and it wasn’t easy to decide which mural to share here. 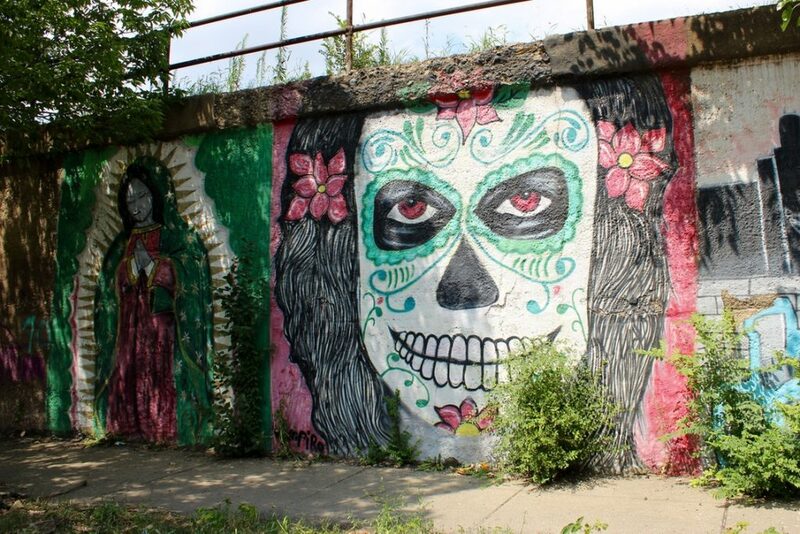 In the end, I chose La Calavera (the Skull) on 16th Street because it conveys much of the Pilsen culture. It is part of a long row of other murals along the railway wall you can admire. 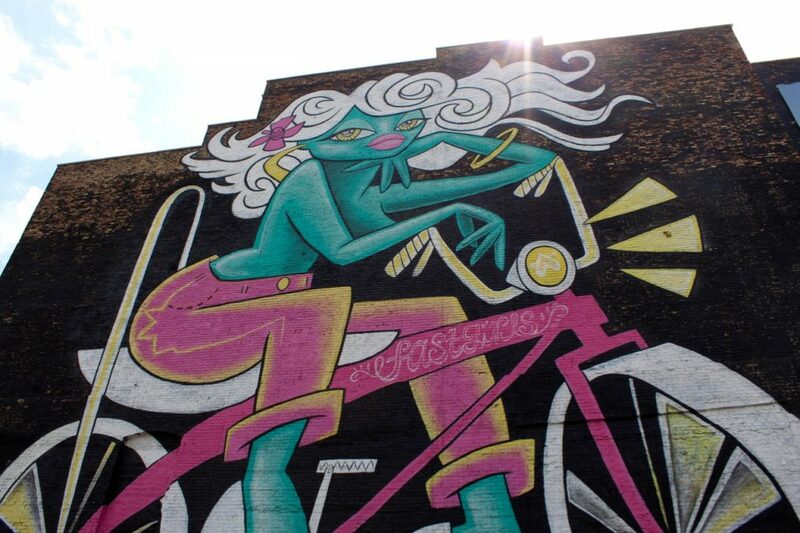 For more examples of cool Pilsen murals, check out this article by wttw. BONUS: Since you are in the area, you should make a stop at the 18th Street El Station (Pink Line) for another extraordinary and different example of street art. The entire train station is decorated with colorful murals painted by local artists from Pilsen. The project was led by art teacher, Francisco Mendoza, who invited his students and anybody else in the neighborhood “who could paint” to participate. The result is an incredible, one-of-a-kind art collage celebrating Mexican culture and heritage. Have you heard about the LACUNA Lofts? Me neither, until very recently. It is a giant building, which used to be the world’s largest macaroni factory (not kidding! ), but it has been recently converted into the coolest office and retail space. It is also a unique venue for private events (apparently lots of hip Chicago weddings have taken place here lately). LACUNA now houses many established and newer artists, as well as small businesses. 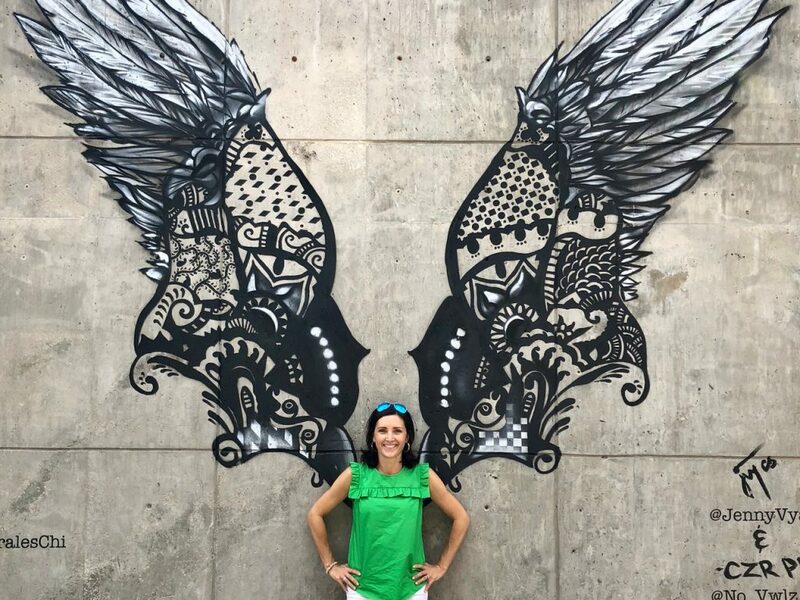 The reason I’m listing it here is that there is some awesome wall art to be found on all sides of the building (including another one of the Fast Girls); too much to share everything here, but trust me, worth checking out! PS: Special thank you to my teenage son who drove around the city with me in search of content for this article and made it extra fun. He also took all the pictures I shared on my Instagram account (@passportsandspice). I love him immensely. Even before he did all this.